Trusted Wikipedia provides the definition for the medical term of “hemoptysis” as coughing up blood. Metal fans are soon to learn another meaning for this word – up-and-coming melodic thrash/death metal from Tempe, Arizona. Actually, Wikipedia is advanced enough to know both definitions. Even though the “thrash” label is attached to Hemoptysis, the band does not fall into numerous horde of retro-rehashers or modern deathcore bedlamers. Thrash is applicable to Hemoptysis only in as much as the band is nestled in a comfortable spot between Kreator and Arch Enemy. A decent number of Arizonians’ influences are coming from a slew of Swedish collectives, rising and falling tremolo of Blood Storm and melodic vignettes in the chorus of Shadow of Death channeling Dark Tranquillity. Label Hemoptysis as you see fit, but the best part about Misanthropic Slaughter is the band’s ability to race along their cuts with unbridled youthful enthusiasm, laying along one mighty riff after another. To say this album is rich with catchy melodies would be an understatement, at the same time there is nothing saccharine in Hemoptysis sound, no matter how inviting the opening of Hopeless and the chorus of M.O.D. might present themselves at first. The band can be fluid and melodic as much as they are aggressive and headbanging (The Cycle and Hadephobia). Looking to their darker side is where Hemoptysis reminded me of Kreator (the title track and the opening riff of And the World Dies followed by more predatory lunges). Masaki Murashita’s vocals are also more reptilian, hissy and scaly version of Mille Petrozza. 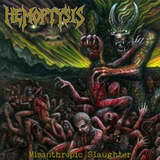 Armored with incredibly skilled, fluid and nimble guitar playing, Hemoptysis is one band where they actually can’t wait to play a solo, immersing themselves deeply into melodic harmonized twin-leads licks, very similar to Amott brothers circa Burning Bridges. At times Murashita and Ryan Miller may overindulge (End of Sorrow), and some may even point to the more traditional and even power metal nature of their solos, but those forays fit the songs integrally and only enhance the enjoyable experience which is Misanthropic Slaughter. Confident in their skills, the band had the right choice going for their production to be full and juicy, where the sound is heard fully, not some emaciated basement clanging. With their absolute and definitive knack for melody, as well as rather mature songwriting for such a young team, my honest worry about Hemoptysis is that they do not fall the victim of the Trivium syndrome. Signing this band is a total no-brainer, and labels like Pulverized or more known Metal Blade absolutely have to be licking their chops trying to sign Hemoptysis. Once that happens, although the territory these Arizonians plow is rather explored or maybe precisely because their sound has a certain feel of familiarity to it, the sheer quality and smoothness of their delivery will attract numerous fans. With that recognition I hope the dumbing down of the approach to broaden the appeal even further will not follow.